Ford’s first book, The Hotel on the Corner of Bitter and Sweet, was on my Top 10 list the year I read it. I did not like Willow Frost as much. Its a good book, and an enjoyable read- I just wasn’t able to connect with it as much. William is the only Chinese boy in a San Francisco orphanage in 1934. On their one outing a year, he sees a beautiful Chinese movie star on the big screen, and becomes convinced she is his long-lost mother. 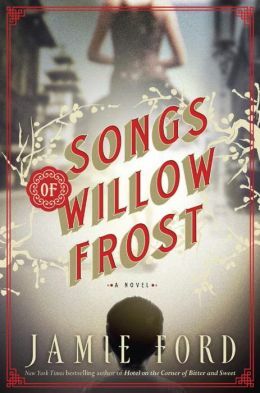 This is the story of William’s search for Willow Frost. It is also the story of Willow herself- how she went from being the daughter of a penniless widow to being a movie star. Both stories are well-drawn. They incorporate the historical climate of racism, war, and one of film’s golden eras. Through their eyes, the past comes alive in colorful- if oten sad- detail. I felt like William’s story was strongest regarding his friends at the orphanage who became his partners in his search for Willow Frost. Sunny, another boy at the orphanage, is marginalized like William because he is Native American. Charlotte is a blind girl who still seems to have the clearest glimpse of William’s dreams for the future. The strongest part of Willow’s story was the few chapters when she was happily in love- in between yeats of humiliation and abuse by her stepfather, and years of suffering and sacrifice as a single mother. What made me most sad- and even angry- was not the people who outright abused the less powerful in this story- minorities, women, children, single moms, and the disabled- but those who saw the abuse and did nothing. For me, in the end, that’s what came through the strongest. Oh, it was a story about family, and love, and heritage. It was a story about what people will do for the people they love. But it also felt like a cautionary tale, about what can happen when we turn a blind eye to those in need around us. Did William find his mom, and was she Willow Frost? I’ll let you read the book to find out. But William discovers that he was always loved- by his friends, his mother, and even the nuns at the orphanage. Willow discovers her own capacity for strength, beauty and love. You might like: Bonesetters Daughter, Amy Tan. This entry was posted in Fiction and tagged book review, Catholic, china, fiction, movies, orphan. Bookmark the permalink.